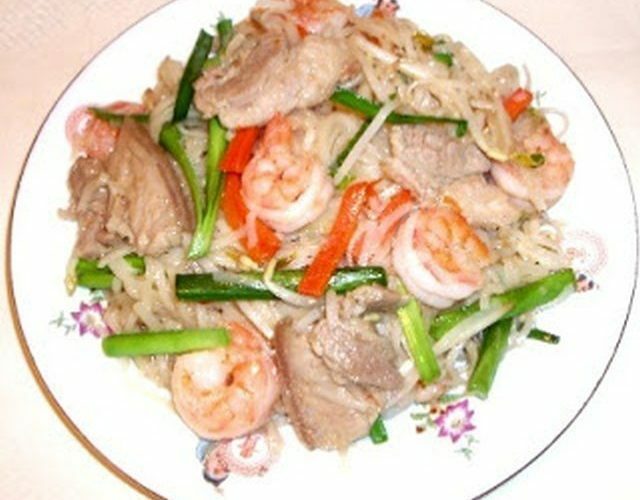 Rice noodle stir fried with pork belly and shrimp is delicious Khmer country food. Put 6 cups water in a large pot, add noodle to boiling water cook till noodle tender( 10 minutes for fresh noodle and about 20 minutes for dried noodle), do not over cook noodle. Pour cooked noodle in a colander, rinsed with cold water and set a side to drain. In a small bowl, mix water with fish sauce, soy sauce and sugar together, mix well and set a side. Heat up a non- stick skillet or wok. When wok is hot, add oil, garlic and pork meat, stirs, add salt and black pepper, stirs well till meat tender. Add yellow onion, carrot and shrimp, stirs till shrimp turns darker pink color. Add cooked noodle stirs till noodle hot. Seasoning with prepared sauce, stirs well, add bean sprouts, chive and green onion, stirs well.